UPDATED, April 12, 12:03 p.m.: Lowe development’s 100,000-square-foot office project is set to rise in the Arts District later this year, after a long wait. The Los Angeles-based firm is building the nine-story mixed-use complex at 2130-2148 E. Violet Street, according to Curbed. It will include 96,700 square feet of office space, 3,300 square feet of ground-floor retail, terraces and a lounge on the roof. The project is designed by Ware Malcomb, and will include new sidewalks and landscaping. Construction is expected to start this year and be completed in 2021. The project was proposed in 2016, and was approved by the city last summer. The property was a former metal recycling facility when the neighborhood was filled mostly with vacant or blighted warehouses. But the area has been undergoing a transformation in recent years. 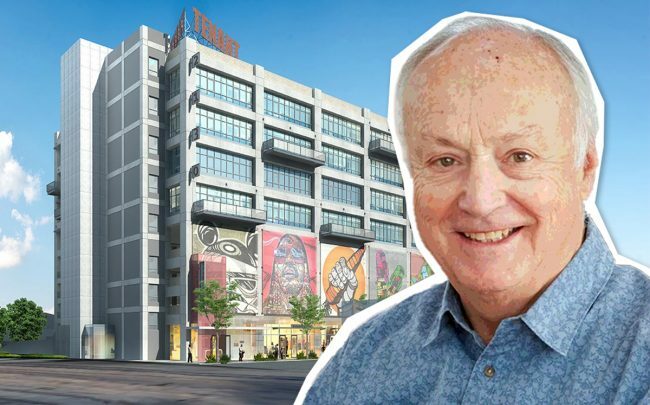 Access Industries, the parent firm of Warner Music Group, paid $195 million for the Ford Factory building in the Arts District, The Real Deal reported last week. The deal was made shortly after Warner Music’s move into the 271,000-square-foot structure. Correction: A previous version of this story listed the overall development at 97,000 square feet, and provided a smaller office portion and larger retail.